I’ve been putting off reading Bruce Adams’ The Politics of Punishment for quite a long time, having flicked through it at some point and gained the impression that it looked incredibly dry. I was right: the work of various commissions and government departments in imperial Russia, while undoubtedly important, is perhaps not the most exciting topic in its own right, but the treatment it receives here really does not help. The book is so acronym-heavy it becomes painful to follow at times, whilst reference to the people involved only by initials and surnames and occasionally departmental affiliations (more acronyms!) with no additional information (the book as a whole suffers from being largely divorced from a wider historical context) means that even recurring characters such as the marvellously named Konstantin Karlovich Grot never remotely come to life, and we gain absolutely no impression of what motivates them. This becomes important for another reason, to which I shall return below, but that ultimately relates to a more serious problem. 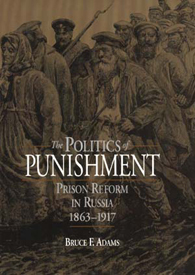 The Politics of Punishment is worthwhile as a study of how the imperial bureaucracy functioned – or failed to – but regarding its central claim that there was substantial reform to the Russian penal system in the half-century before the revolution, it falls down in several respects. Most significantly, it downplays the large-scale failure to implement reform and, as Schrader notes, ‘mistake[s] the rhetoric of reform for its reality’ (Languages of the Lash, p. 188). As a result, the picture of the penal system that emerges is so different to that we read about in memoirs and eye-witness accounts that, as UEA PhD student Mark Vincent commented in a recent Twitter conversation, one wonders if Adams is actually talking about the same system. Having one’s usual perspective challenged in this way is normally a good thing, but Adams makes no attempt to account for this difference (the tendency to examine the reforms in a vacuum is particularly apparent here). He simply dismisses books such as Kennan’s Siberia and the Exile System (vol. 1 | vol. 2) as only being interested in political prisoners (Politics of Punishment, p. 5), and makes no further reference to any counter-evidence. In my recent article in Europe-Asia Studies, ‘Knowing Russia’s Convicts‘ (now open access), which forms the basis of the chapter I’m writing, I argue that the peasant convicts were in fact central to katorga and exile narratives, and it’s through thinking about why (and how) they become so important that I have come to question various of Adams’ premises. Let’s leave aside the fact that Adams is perfectly happy to draw speculative conclusions in other areas, for example in his willingness to ascribe humane motives to the reformers (although one might well question how humane reforms that envisaged building 75 prisons on the model of Pentonville – a byword for the inhumanity of prison regimes at the time – would be), or in the idea that this originated in the need to keep up with the European neighbours (pp. 140-1). Beyond this, one might suggest that the frequency and vigour with which both Adams and his champions of prison reform deny the primacy of economic motives may well in fact be an indication of their significance. This pertains particularly to the question of penal labour – touted primarily as a means of reform (thereby creating a link between katorga labour and the Stalinist concept of perekovka or reforging, a question I shall explore elsewhere in my book), and with the financial benefits hidden in the small print, so to speak. But in the context of the Great Reforms and the recent emancipation of the serfs, how significant is it that prisoners and exiles were considered a source of free labour, and to what extent was the Russian economy – accustomed to serfdom – reliant on the existence of sources of free labour? These questions are increasingly important to my work, so various books on the peasant question and on Russian economic history beckon. Any recommendations for good readings on these topics will be very gratefully received. So The Politics of Punishment, because of what its deficiencies reveal rather than despite them, has raised an important question for me. Abby Schrader’s Languages of the Lash has proved extremely valuable in my thinking about the answer to that question as well as raising others, but for much more positive reasons. I first read this not long after it was published, but it’s only on this reading that I have realized quite how impressive it is, and that is partly because of the contrast of Schrader’s approach to Adams’. While The Politics of Punishment focuses solely on the question of penal reform, and as a result suffers greatly from the absence of a wider context, Schrader does not address corporal punishment as an isolated question. Rather, she uses it as a prism through which to explore wider questions about social structures and identities in imperial Russia, and to show how contradictions in legislation and rhetorical inconsistencies reveal the limits of the reforming agenda more generally. There is a great deal worth discussing about this book, but I shall just address a couple of key points that are particularly illuminating for my own work. Above all, I was struck by Schrader’s examination of the ways in which social identity and the relative privileges (or burdens) of membership of particular estates (sosloviia) were, at least after 1785, related to exemption from – or liability to – flogging. Clearly the application of varying degrees of punishment to offenders of different social status was not unique to Russia, but the fact that this was enshrined in law (once there was a proper legal code rather than a jumble of contradictory ukazy) and in itself was used as a means of social engineering, must have been much more unusual. This is significant for me because of the correlation that arises following the Great Reforms between (male) peasants – no longer enserfed but being kept determinedly at the bottom of the social heap – and convicts (of both sexes), as they remained the only two groups that were still subjected to corporal punishment. In essence, the system treated peasants, both during and after serfdom, as if they were already criminals, regardless of whether any crime or misdemeanour had been committed, and convicts as if they were serfs. This is important not only from the point of view of writers’ inscription of the identity of convicts in nineteenth-century narratives – the central focus of my chapter – but also in relation to the question I raise above about the use of prison labour and the economy’s reliance on free labour. 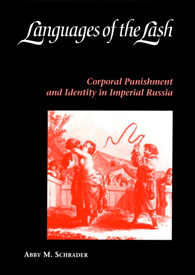 A second significant parallel that emerges, which Schrader explores in some detail in her final chapter, is that of punishment to crime, as reformers posited a connection between flogging and domestic violence: one Privy Councillor ‘correlated the prevalence of corporal punishment with wife beating, implying that the brutality of both state and home reinforced Russian society’s moral depravity.’ (Languages of the Lash, p. 164) Schrader shows that this becomes a serious issue that threatens to ‘infect’ all those involved in the flogging, and by extension, all of Russian society (p. 77) – again this is something my article addresses.